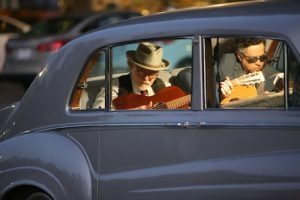 Forty years after the death of Elvis Presley, two-time Sundance Grand Jury winner Eugene Jarecki takes the King’s 1963 Rolls-Royce on a musical road trip across America. 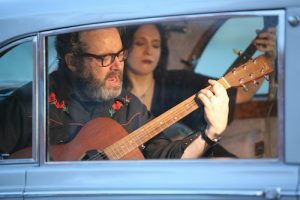 From Tupelo to Memphis to New York, Las Vegas, and countless points between, the journey explores the rise and fall of Elvis as a metaphor for the country he left behind. What emerges is a visionary portrait of the state of the American dream and a penetrating look at how the hell we got here. The King premieres on Independent Lens Monday, January 28, 2019, 9:00-10:30 PM ET on WOUB. Eugene Jarecki (Director/Writer/Producer) is an award-winning documentary director and producer. After directing The Trials of Henry Kissinger in 2002, Jarecki won the Sundance Grand Jury Prize and a Peabody Award for his 2005 film Why We Fight. In 2010, he created Move Your Money, a viral short encouraging Americans to shift their money from “too big to fail” banks to community banks and credit unions. His Emmy-Award winning 2011 film, Reagan, premiered at Sundance before broadcasting on HBO. The House I Live In, his 2013 film about America’s War on Drugs, once again won him the Grand Jury Prize at the Sundance Film Festival as well as a second Peabody Award; its broadcast premiere was on PBS’s Independent Lens. He executive produced the Sundance Award-winning documentary (T)ERROR, as well as Denial, which aired on PBS in 2017. In 2016, Jarecki directed The Cyclist as part of Amazon’s “The New Yorker Presents” series.